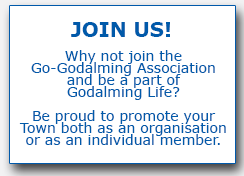 The Go-Godalming Association has at its core the following organisations that are full members of the association but are run independently by their own management teams and volunteers. We are dedicated to encouraging participation in sport by promoting events and the provision of first class facilities in the area, and to highlight sports issues and support local sports organisations and individuals. The GO-Godalming Association launched the annual Music in the Park in 2006 to provide local people and visitors alike with a range of outdoor concerts - and to provide these free for music lovers to enjoy. Now in its 10th year the £1,000 monthly GOLO draw raises money for local good causes in Godalming and surrounding villages. GOLO is England's first small town lottery and is run entirely by unpaid volunteers. The club encourages young people to enjoy canoeing not just along the river Wey but also other waterways through organised trips. Safety and water skills are taught and our young canoeists are also encouraged to work towards a B.C.U. award. We have a large number of local organisations who are closely affiliated to the Go-Godalming Association or are members.